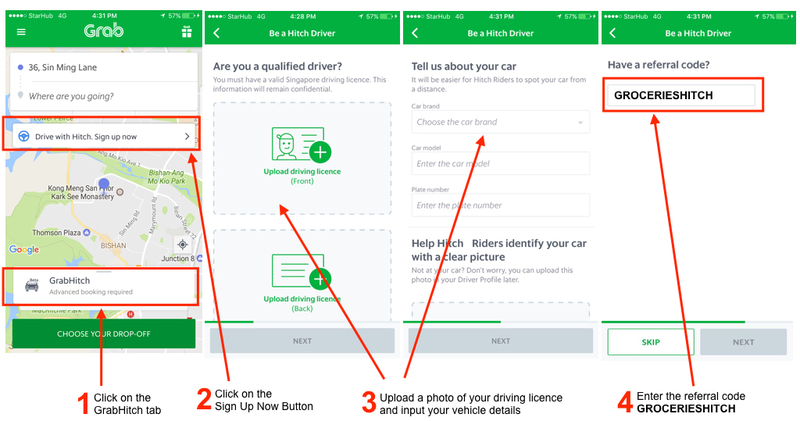 Just to get you started on this awesome service, from now till 31 October 2017, get $20 when you sign up to drive with GrabHitch! Simply include the Referral Code ‘GROCERIESHITCH‘ when you sign up with us on the Grab App. This incentive is only eligible for new drivers who sign up and successfully complete 1 Hitch ride as a driver between 6 July 2017 @ 00:00 hours –30th November 2017 @ 23:59 hours. New drivers must sign up with the referral code GROCERIESHITCH in order to qualify for the $20 NTUC voucher incentive. The processing of the $20 NTUC voucher will only be conducted after the incentive period has ended (post-30th November 2017). Please allow up to 10 working days for the processing of the $20 NTUC voucher incentive. Please note that the $20 NTUC voucher is not exchangeable nor refundable. Have questions? Email us at support.sg@grab.com with subject “GROCERIESHITCH” and we will get back to you in 2-3 business days.